This informative off-road red-race news bulletin aims to inform newbies to the off-road sport and off-road activities in Baja California as well Baja visitors. Industry insiders and regulars are well aware of that crook. Be aware of the US American Mike Overcast that operated with several aka's as well with several company ma,es. 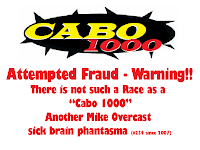 Most noticeable "Baja Safari"
He promotes by his audio lie-casts as well at locations across SoCal a event he named "Cabo 1000" as a "Red Race" which by his description is a illegal race. 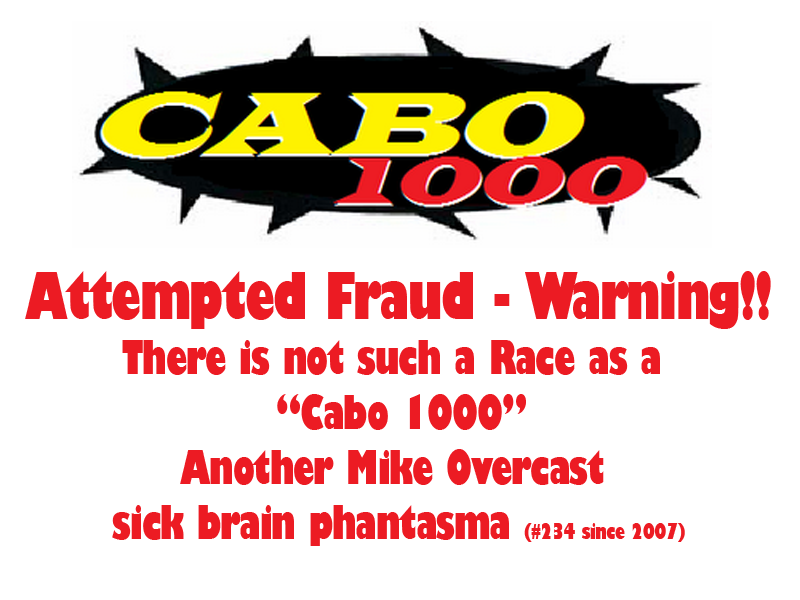 Now there has never been any race or race-like event called Cabo 1000. He uses this - like many other of his paranoid inventions - for his extortion and basically he's out to screw people selling somethings that does not exist! of links at many different sources over several - 5+ - years. Just in case of the unlikely event h get's with some of his lame friends a race-like environment set up and pretend a start to get $ from you for the xxxxxx$ price-money he always announces for his events this would be all illegal!! Do not believe that there are no laws and regulations in Mexico. There might be a higher per capita % on corruption but laws do exist and you would be subject for prosecution and end up with a lot of problems including jail!! There is no Cabo 1000 - stay clear of mike Overcast and all of his operations is all we can highly recommend you! !